At what point is the ~/.bashrc file created? For instance, if I were to run the command adduser test, is the .bashrc created automatically upon creation of the home directory for the user test? If it's not created upon user creation, under what conditions is it created? Also, if I add a .bashrc file to the home directory of a user, will it be overwritten by the OS? useradd will create a home directory and populate it with a copy of /etc/skel if the -m --create-home option is supplied. Thanks for this comment to @jwodder. The option -s --shell will change the name of the new user's login shell. No matter what the new user's login shell is, the entire content of the 'skeletal' directory /etc/skel will be populated into the new user's home directory. A different 'skeletal' directory cold be defined with the -k --create-home option. The configuration file of this command is /etc/default/useradd. The configuration file of this command is /etc/adduser.conf. The default value for the new user's login shell is deteminated by the variable DSHELL=. It could be specified also via the option --shell. No matter what the new user's login shell is, the entire content of the 'skeletal' directory /etc/skel will be populated into the new user's home directory. The SKEL= variable in this file specifies the default directory containing 'skeletal' user files. The option --no-create-home will force the command adduser to do not create a user home directory, respectively the content of the 'skeletal' directory will not be copied. If called with one non-option argument and the --system option, adduser will add a system user... A home directory is created by the same rules as for normal users. 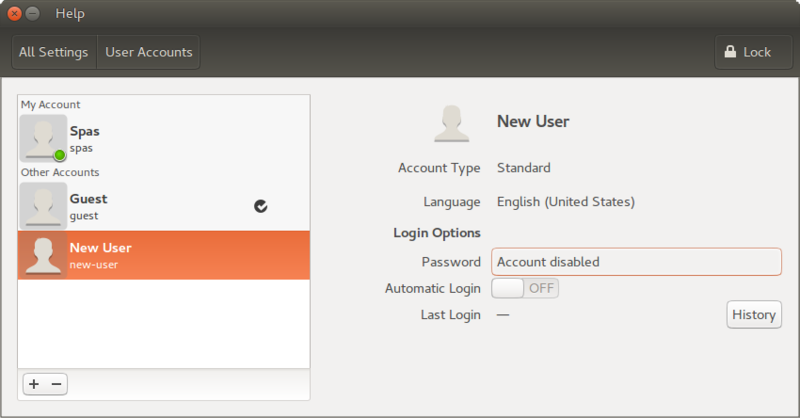 The new system user will have the shell /bin/false (unless overridden with the --shell option), and have logins disabled. Skeletal configuration files are not copied. ...from the manual page. Additionally, when the user is created with any GUI tool as User Accounts, the result is identical to that of the command adduser. What's the difference between "adduser" and "useradd"? What is the *nix command to view a user's default login shell? Not the answer you're looking for? Browse other questions tagged command-line bash bashrc or ask your own question. '~/.bashrc' vs ' /etc/skel/.bashrc'. Why are there two '.bashrcs'? Ubuntu 18.04 - Where is .bashrc?